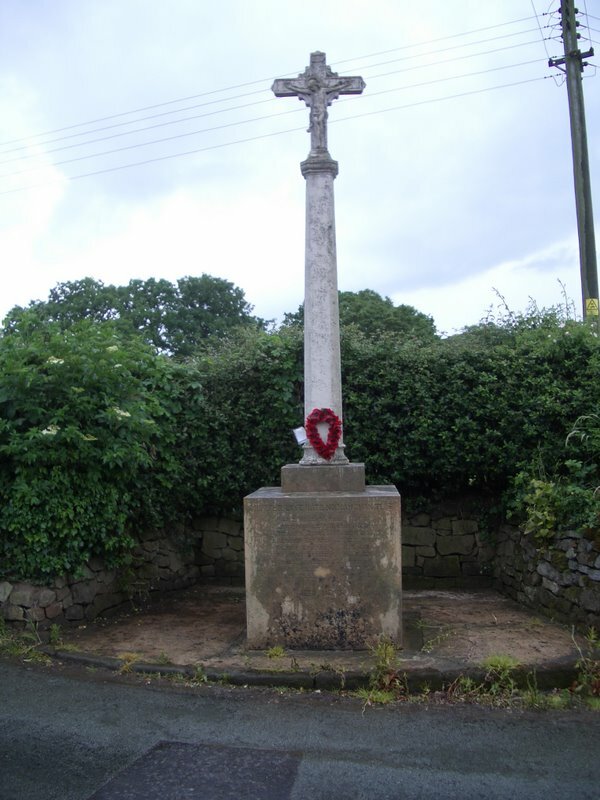 The war memorial in the village of Little Ness in north west Shropshire is a Portland stone crucifix on a pillar standing on a Grinshill stone square double base. 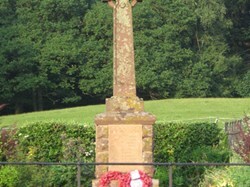 On the front panel of the base the names, ranks and regiments of the nine men of the village who died in World War I are inscribed. On the side panels are the names of the forty men who went on overseas service and returned, and on the fourth side are the names of the men who joined up but did not see active service. 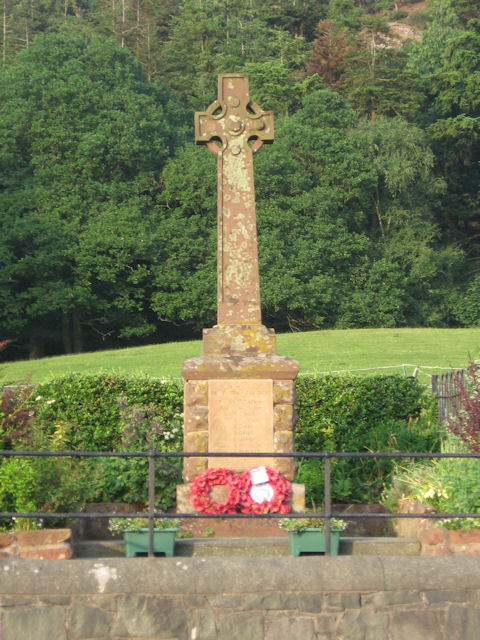 The memorial is a wayside cross, standing near the post office. 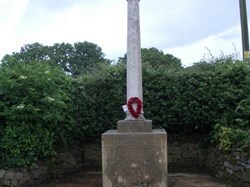 The memorial is located on the roadside approximately 50 yards past the old Post Office. Darby, Maurice Alfred Alexander. Mentioned in Despatches (20). Lieutenant, 1st Bn., Grenadier Guards. Killed in action at Neuve Chapelle 11/03/1915. Buried Little Ness (St. Martin) Churchyard, England. South-West of Church. Son of Alfred E. W. and Frederica L. J. Darby, of Adcote, Little Ness, Shrewsbury. Davies, Richard Edward (22). Private, 20576, 1st Bn., Border Regiment. Died of wounds 04/07/1916. Buried Doullens Communal Cemetery Extension No.1, France. Grave: III. B. 7. 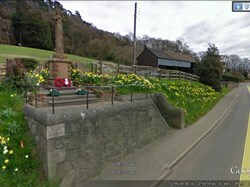 Son of John and Harriett Davies, of Valeswood Cottage, Little Ness, Shrewsbury. Edwards, Arthur (24). Private, 18954, 12th Bn., Cheshire Regiment. Killed in action 18/09/1918. Remembered upon Doiran Memorial, Greece. 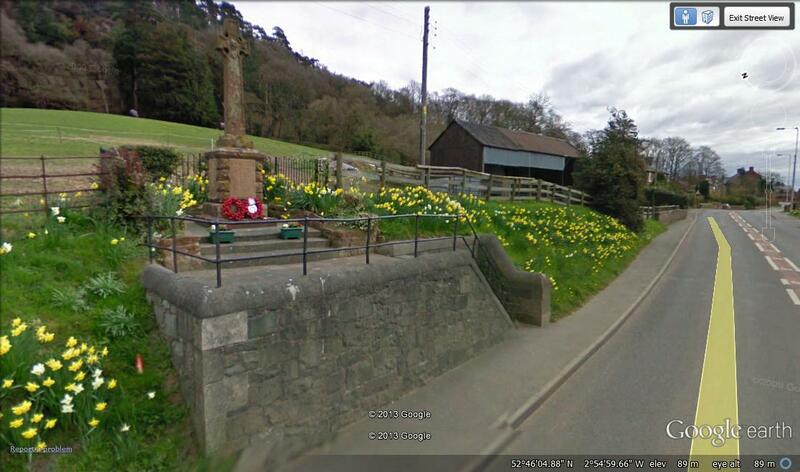 Son of Elias and Annie Edwards, of 26, Nibs Heath, Montford Bridge, Shrewsbury. Edwards, Sydney (21). Private, 22440, 7th Bn., King's Shropshire Light Infantry. Killed in action 18/08/1916. Buried Guillemont Road Cemetery, Guillemont, France. Grave: VIII. L. 7. Son of John and Alice Edwards, of 11, Church Lane, Little Ness, Shrewsbury. Ratcliffe, Bernard Sutton (30). Private, 28364, 3rd Bn., Grenadier Guards. Killed in action 04/11/1918. Buried Frasnoy Communal Cemetery, France. Grave: A. 18. Son of Thomas and E. Ratcliffe, of Brook Farm, Waesbury, Oswestry, Salop; husband of Hilda Mary Ratcliffe, of Carlton-in-Cleveland, Stokesley, Yorks.